General Hospital (GH) spoilers tease that Jason (Billy Miller) and Patient Six (Steve Burton) will continue to face some stressful situations. Patient Six had to fight his way home from the clinic in Russia, but now his old life is largely gone. Current Jason’s also freaking out over the potential of losing everything. This is a very emotional battle and it’ll only get more traumatic as time goes on. BM Jason fears that Patient Six will come after Aurora Media and anything else he can get his hands on. Patient Six doesn’t care about owning a media company, but it looks like he’ll push for it anyway. He’s facing intense pressure from Sonny (Maurice Benard), Carly (Laura Wright) and Diane (Carolyn Hennesy) to stake claim to everything that is rightfully Jason Morgan’s. Despite his reservations, P6 may try to strip Jason of his assets and add fuel to the fire. Patient Six will undoubtedly hand everything over to Sam (Kelly Monaco) so she can do what she wants, but this will still infuriate Miller’s character. Current Jason’s anger is already at an all-time high, but his rage will somehow manage to intensify down the road. It’s clear that BM Jason is on the edge of something dangerous. Based on what we’ve seen so far, Patient Six should probably be afraid of a victory. If Burton’s Jason succeeds in winning over Sam and taking back his life, Miller’s Jason may feel like he has nothing left to lose. He could come after the man he believes is Drew and attempt to make him pay for stealing everything. Of course, General Hospital spoilers say classic Jason could be a real threat as well. Patient Six plays it cool on the surface, but he must be fighting back some anger. After all, P6 had a violent nightmare where he shouted at Jason to get away from Sam. He pumped some bullets in his rival as Sam went into panic mode. Is this a premonition of an ugly altercation or will Patient Six manage to control whatever fury’s buried deep within him? It probably depends on how Sam’s treated moving forward. That’s mainly what this GH battle boils down to. A name is just a name and assets aren’t that big of a deal in the grand scheme of things. This war is about Sam and the “JaSam” family unit. Who will snap first in this fierce fight? Will Jason have a rage-filled breakdown or could Patient Six be the one to finally explode? We’ll give you updates as other General Hospital news comes in. Stick with ABC’s GH and don’t forget to check CDL often for the latest General Hospital spoilers, updates and news. 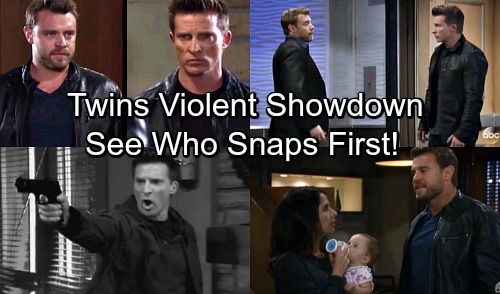 Who Snaps First and Gets Violent – SB Jason or BM Jason?